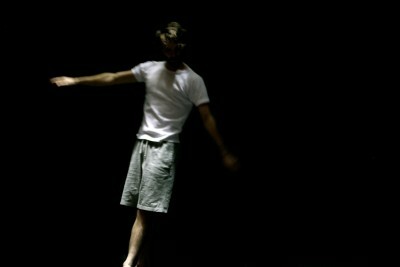 Barely Imaginable Being is a solo for the nervous-system, a saturating solo dance performance. The project stems from a one year artistic research that looks into the (dis)embodiment of movement through the use of a randomly produced auditory score that announces the movement for the dance performer. Throughout the performance the score accumulates and becomes a sound landscape, the result is an unscrewing of the relation between the dance and its choreography, between the dance and the performer, between what one hears a body do and what one sees a body dance. Sound: Fanz Liszt, Sonetto 123 del Petrarca - Après une lecture du Dante (Fantasia quasi Sonata) (1856). Written text passages inspired by Witold Gommrovicz, Ferdydurke (1937).